Listen up, guys! The recommendations for prostate cancer screening have changed – sort of. The US Preventive Services Task Force (USPSTF) recently announced it’s stepping back from its previous recommendations, issued in 2012. Then, the task force, a government-appointment volunteer panel of experts, opposed men getting routine screenings using the prostate specific antigen (PSA) blood test. 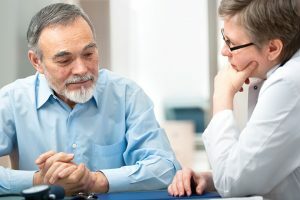 In their new draft guidelines, released April 11, they instead suggest men discuss the benefits and risks with their doctors and then decide if they want to proceed with the PSA test. This shared decision-making approach has long been the recommendation of many medical groups, whose physicians have used it as standard practice with their patients for years. The USPSTF’s initial opposition to the PSA test was based on several factors. The panel determined, using information available at the time, that the risks of screening outweighed the small chance of detecting a deadly cancer. The risks it cited include the potential for false positive results, the overtreatment of slow-growing cancers and the inevitable side effects that result from those treatments. What helped change the task force’s mind were two major studies of prostate cancer screening. The first, conducted in Europe, found that men who had the PSA screening every two to four years lowered their risk of dying from prostate cancer by 20 percent. Further, for those who did have prostate cancer, regular PSA screening lowered their chances of developing metastatic disease by 30 percent. The second study, this one done in the US, compared outcomes for men who were screened and chose not to treat their cancers right away, but rather monitor them carefully to watch for tumor growth, then treat them if necessary. This practice is known as active surveillance. The US study found men who chose active surveillance did not die sooner than those who received immediate treatment. This is especially good news because active surveillance has increased in popularity among men in this country. It also means that men can get the PSA screenings and not undergo the biopsies and treatments that posed risks that made for one argument against the tests. Thanks in part to these studies, the scales of balance have shifted. Suddenly, the benefits of PSA testing outweigh the risks. But there still are risks, and a lot of unanswered questions from the USPSTF. The task force’s draft recommendations differ from other medical groups in when screening should begin. They suggest the shared decision-making process should begin at age 55. Other groups recommend starting earlier depending on risk factors. The USPSTF simply didn’t take a stand on how often men should consider screening, nor did it make any specific recommendations for high-risk groups, such as African Americans and those with a family history of prostate cancer. Many medical groups, including the American Cancer Society, urge high-risk groups to begin screening before age 50. The USPSTF’s draft guidelines put the task force more in line with the recommendations of other major medical organizations, such as the American Cancer Society, but it’s really a common sense message. Men need to be their own advocates and have an in-depth conversation with their doctors about the good and bad of PSA testing. Once a man and his doctor have discussed all factors pertaining to that man’s health and safety, he can make a decision whether or not to be screened for prostate cancer. It’s about being informed and having a choice.